The Kaye Posture Control Walkers (imported from Kaye Products Inc. in the United States) are designed as reverse or posterior walkers. 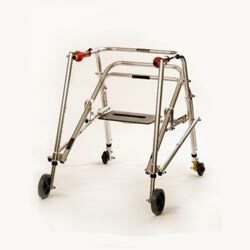 When using these walkers, the user faces away from the rear bars and towards the open end of the walkers. This design (when compared to traditional, forward walkers) facilitates postural alignment, balance and components of gait. The support behind the user encourages a more upright posture. The handgrips beside the user encourage improved upper extremity position. Centering the user within the walker and over his own two feet encourages the development of balance. 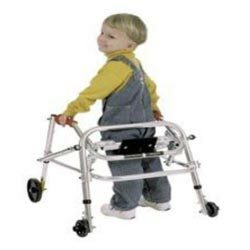 The rear horizontal bars encourage the user to step forward as he moves the walker forward. Pulling the walker helps the user avoid having to, after each step, stop walking and place the walker further to his front.